Cookbook of the Week #1: Super Natural Cooking: Five Ways to Incorporate Whole and Natural Ingredients into Your Cooking by Heidi Swanson (Celestial Arts, 2007). It's been more than 'a few weeks' since I blurted out something like I was heavily cooking from cookbooks, but I wasn't lying... at least not in a sense that I really have been cooking a lot from excellent cookbooks. Not having time to blog about it is such a hoary excuse, yet now I have finally got on it - at least the first bit of it. Now it's been more than just a few weeks - more like a few months now - since Heidi's latest book was released earlier this year. Just like her long-loved, famed foodblog 101 Cookbooks, the book is blessed with her discerning eye for natural food, hip vegetarian recipes, and stunning photographs, all well organized and beautifully desgined. Just like fresh, wholesome dishes nourish our body, her works do so our mind - and cooking such food from her book is simply a pure delight. Over a week's time or so last month, I cooked intensively from the book and managed to photograph most of them. All I needed now was simply to put them here; simple as it may sound, I just couldn't get around to it, as I was trying to do it all in one go (as if!). So I have given up the idea of showing the world one complete post about it at once (although I have done so on my Japanese blog), here I am doing it by inchmeal; meaning, I've scattered the photos first, and putting brief notes one by one, perhaps one or two a day, hopefully over the period of one week this week. This seems slightly more doable, huh? 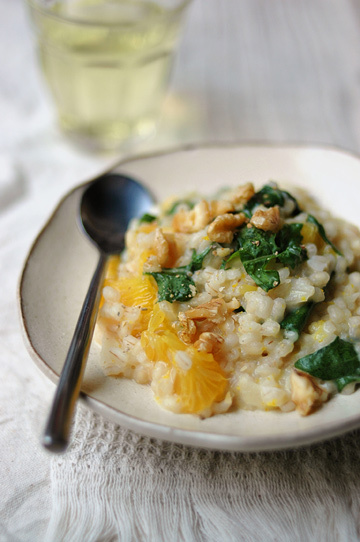 Risotto-Style Barley with Winter Citrus and Arugula. This, as its name suggests, is barley cooked in the way you cook rice to make risotto. 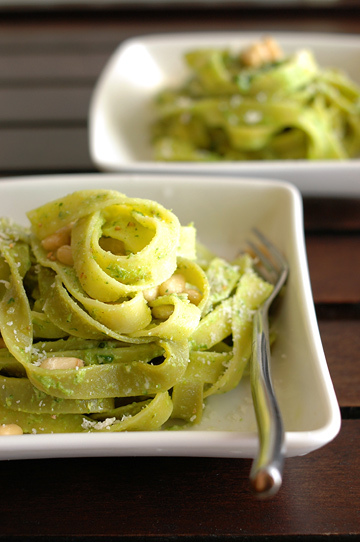 Creamy and starchy grains are given a layer of different dimensions of flavors and textures of tangy citrus, bitter arugula, sweet walnuts, and rich Parmesan. Although this is in theory intended to be a winter dish with the use of winter citrus (lemon and orange), I just couldn't wait until winter and instead simply used Japanese summer orange that was in season. It worked just fine, except I forgot to adjust the amount of juice and zest required, where I made only half of what the recipe has (ouch). It turned out rather bitter, nonetheless tasty. 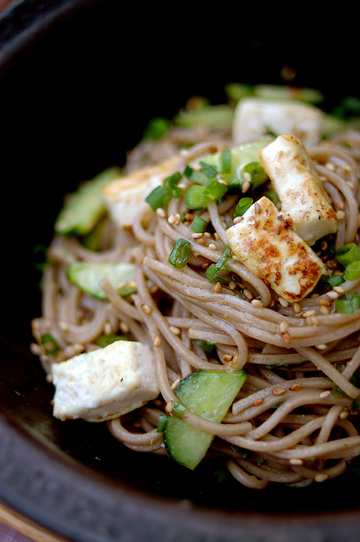 Green-Packed Stir Fry with Fresh Herbs. 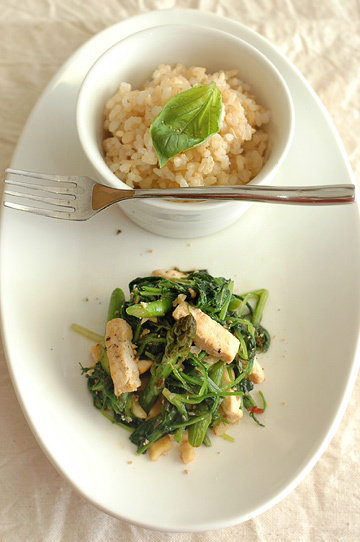 Asparagus and spinach are quickly fried in sesame oil along with garlic, ginger and chile, then finished with an addition of seared tofu, fresh mint and basil, as well as lime. I didn't use hoisin sauce the recipe calls for, as I don't particularly fancy this ubiquitous seafood-based sweetish sauce* myself, but regular soy sauce (of good quality, though) did a great job. The mixture of herbs and spices gave this dish a bit of Southeast Asian touch, which makes this a perfect dish on a warm day. And just as Heidi suggests, I served it alongside of brown rice (not exactly as it is shown in the photo above though - I actually had it on rice), which clearly was the way to go. * Note: Hoisin sauce actually doesn't actually contain seafood ingredient, contrary to what I believed based on its original name in Chinese character meaning 'seafood'. My apologies for any confusions. Spring Minestrone with Brown Rice. 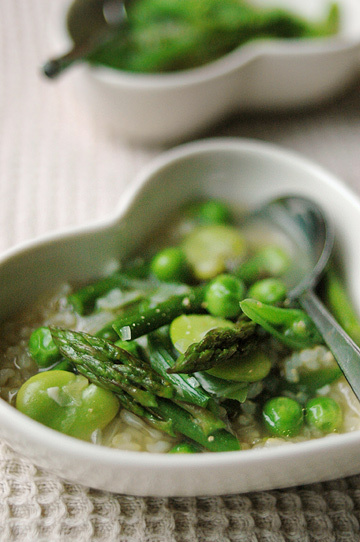 Another such dish loaded with spring greens, including asparagus, peas, and fava beans, making the whole bowl of soup a real vibrant green goodness. It was a refreshing discovery to see how the lightly fried onion and shallots, with the aid of vegetable broth, lend such a depth of flavor - while the suggested few variations of additional toppings such as Parmesan and herbs sounded nice, the soup tasted just lovely as is. Now I confess that I shortcut by using cooked brown rice from the freezer instead of cooking it from scratch in the broth, but it still made a great dish; a lot of time saved, as well. Otsu. This recipe alone would have justified me for buying the book, if you ask me; now if you remember Heidi once ran a post about this Japanese-inspired (sort of) buckwheat noodle dish (and I did, too, for that matter) - and better yet, have tried it yourself-, you'd be crying for joy to find its recipe again in the book. Despite some modifications made for the dressing ingredients (I think), the dish tasted just like I remember it had done last time I made it - which is almost three years ago now, and while my tastebud memory may not be super-realiable, I remember it as an ultimate summertime dish perfect for a warm day's lunch, and I still think it is. Now, although it may be invisible and largely inconsequential to most people, there was a major, major accomplishment I had here; cilantro. My enemy of my lifetime (well, at least ever since I first encountered it in some Southeast Asian dish long time ago), that particular herb that I loathe and effectively neglect its existence whenever I spot ts name on a list of ingredients for a recipe or a menu of dishes at a restaurant. 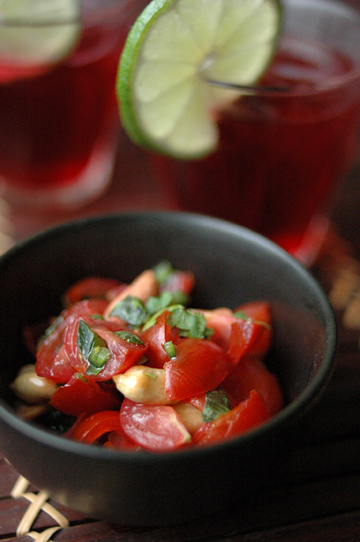 For this recipe, I was originally going to replace it with another herb or just skip it (that is what I did last time), and yet I'm not sure how, but it somehow occurred to me that I might try and use cilantro - a little tiny bit. And to my surprise, I was alright with it; I would have been totally happy without cilantro in the dish, but it was fine. I could handle it. So this officially made the first dish for which I bought a bunch of cilantro by myself. 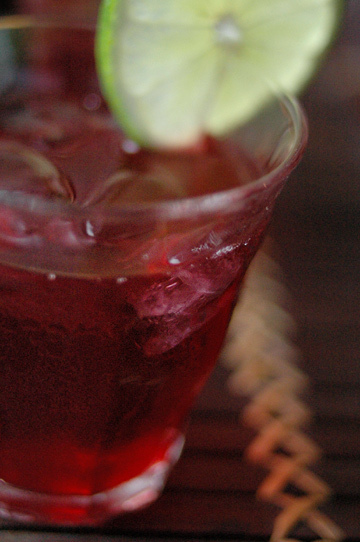 Agua de Jamaica. Despite its apparent translation as "water of Jamaica", Jamaica is not to refer to the name of the Carribean country but to mean hibiscus, as I first learned here. I've enjoyed hibiscus infusion for a long time, but store-bought hibscus tea usually comes as a mixture with dried rosehip. 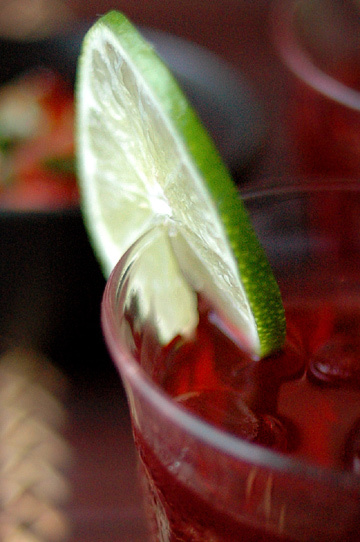 Although I liked it that way, I found this way of enjoying hibiscus infusion with lime instead of rosehip pleasantly mild and utterly refreshing. I have always wanted to but yet to make it to Mexico (or anywhere in Latin America for that matter), but these almost made me see me being in some small Mexcan town - sometime, hopefully, sometime. Peach Nectar Iced Tea. It's iced tea with peach nectar as you might guess, except that I made it with peach-scented black tea (the brownish one) as well as Lupicia's excellent White Peach Oolong Tea (yellow). 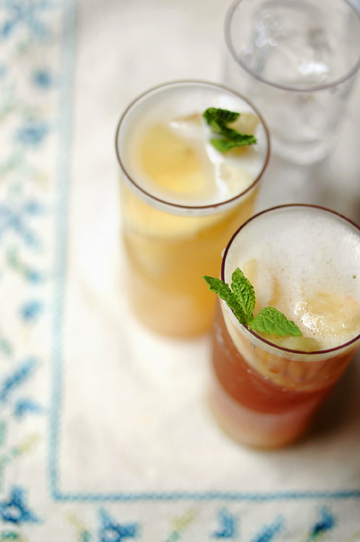 Both were equally refreshing, but the one with oolong tea turned out extra-light and flavorful. 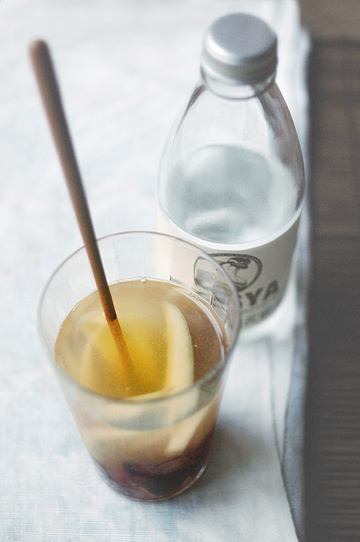 ... so here we go: Layered Peach Nectar Iced Tea (with black and oolong teas). 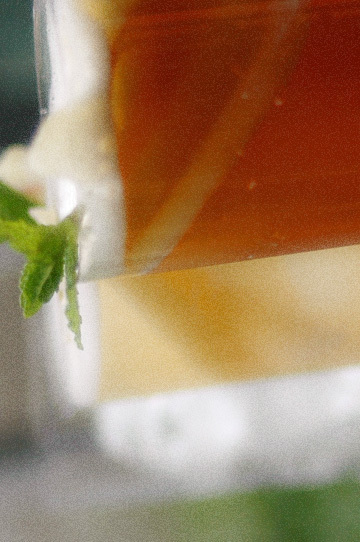 I added gelatin to peach nectar and teas separately, refrigerated them until set, then crushed and put into glasses in layers - exactly like I did when I made that lovely Jellied Plantation Tea years ago. This is a fool-proof method to make a pretty dessert that impresses your guests, and it workd just as well with the peached iced tea. Coconut Panna Cotta. Or maybe more like cocco-cotta, as this is made of coconut milk rather than cream (panna), but whatever you call it this makes a perfect dessert that is really easy to make, looks pretty dressed up with sauce of your choice, and is sure to please kids and adults and the likes. 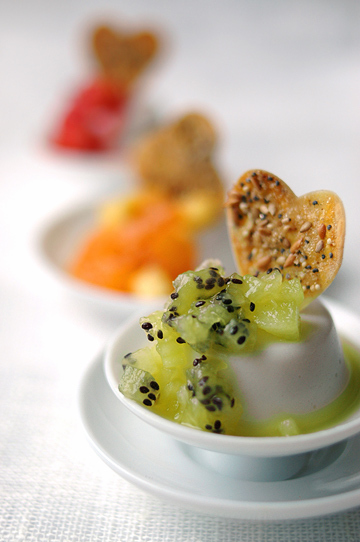 Jellied with agar, these panna cottas come out firmer than ones using gelatin, and that makes an interesting difference. I served them with a trio of chunky fruit sauce: kiwi-rosemary, mango-mint, and strawberry-basil, all of which nicely complemented the creamy white cups. Also served along with are seeded crackers, presented as Animal Crackers in Heidi's book. Those paper-thin crisps are made of wonton wrappers, cut out to shapes you like and spinkled with sugar along with a variety of seeds, which in my case included sesame, popy, amaranth, and flax seeds. I made those a large bowlful, but they disappeared instantly around here. 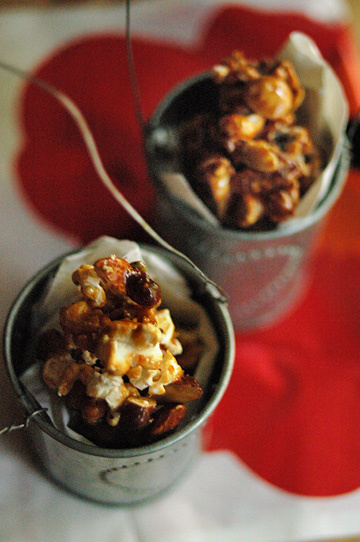 Spiced Caramel Corn. Freshly popped corn kernels were tossed in spiced syrup, which doesn't contain sugar or corn syrup like in so many other caramel corn recipes, but uses brown rice syrup and maple syrup - and I also used honey. It may be hard to tell from the picture, but I made two different mixtures: one with syrup with cinnamon, nutmeg, chile (as is suggested in the book) and cashews, macadamia nuts, pecans, and pumpkin seeds; the other with syrup using honey instead of maple syrup, infused with zest of orange, caldamom, and ginger, and mixed with almonds, walnuts, and pistachios. While both turned out to be properly more-ish like any good caramel corn should, popping the kernels was a bit of challenge to me; I ended up doing it in the microwave, which saved me quite some time, attention, and cleanup afterward. Finally, there are a couple of other things that I made from the book after I had first posted this (which is a moth ago... ugh). White Sangria with Agave Nectar and Drunken Peaches. 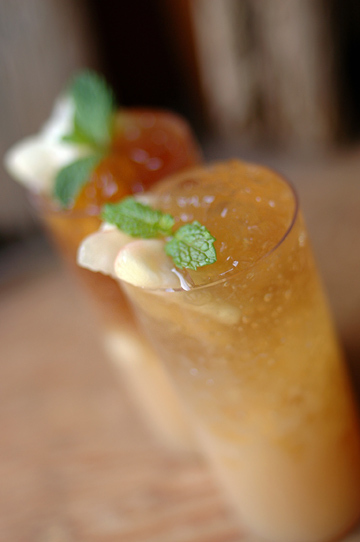 Wine-soarked fresh peaches were topped with sparkling water to make this fabulously refreshing and light drink. With agave nectar being rather hard to come by over here, I simply subsituted it with mild honey, but I think it did all right. 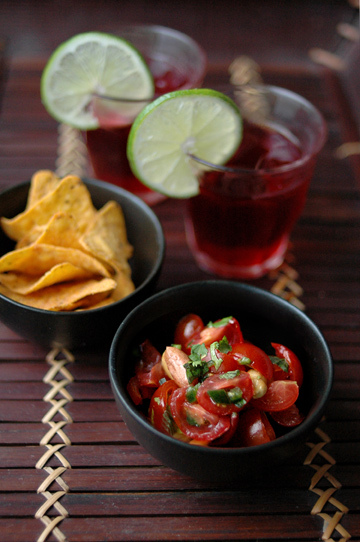 Although, next time I make this I would like to try it with agave nectar - I've spent some time looking for agave nectar, which is why it took me a while to get around to making this, even if it was one of the things that I wanted to try from the book. 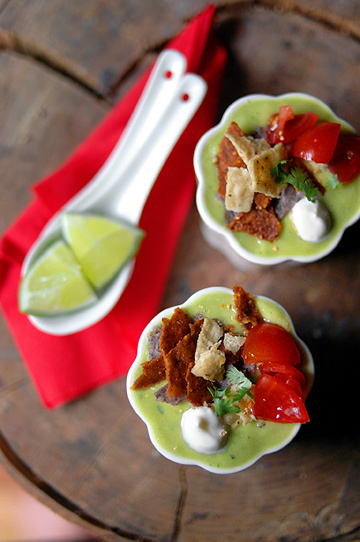 Crema de Guacamole with Crunchy Topopos. Ever since I got to know of this beautiful Mexican soup in one of Heidi's post a while back, I had long meant to give it a try, knowing it would be hard to get tomatillos in Japan; even though I do know there are canned ones around, I couldn't find them in my neighborhood, let alone fresh - so I just used fresh green tomatoes, which have been around in Japan only recently. Now it's basically guacamole in a form of soup as the name suggests, and despite how rich and creamy it looks - and actually tastes -, the soup itself is daily- and fat-free, with its creaminess coming only from avocadoes. I also couldn't readily find corn tortillas, for which I made it up using store-bought tri-color corn tortilla chips. Even with such make-do here and there, the soup tasted great - this, hands down, is one of the most beautiful soup I have ever come across. Is it bad that my diet lately has been so horrendous that just looking at these photos make me feel cleansed? But then again, your photos always have a visceral quality, I don't expect anything less. Lovely to be inspired by fellow bloggers. Mandarin-style Hoisin sauce ingredients include water, sugar, soybeans, white distilled vinegar, rice, salt, wheat flour, garlic, and red chili peppers, and several preservatives and coloring agents. Traditionally, Hoisin sauce is made using sweet potato. Oh these look great! The otsu, straw and hay fettucine and the risotto-style barley! I'm so going get my hands on this book! You are a cooking diva, aren't you? I've never seen so many great and tasty-looking photos in one post. I'd sure like to know about that ruby red drink. What is it? Tes photos sont "wonderful" !!! I'm in love with your blog and photos...my congrats! You make me miss Japan more than it is humanly possible. I can almost taste the delicate flavor of your food. Let us know when you publish a book (if you haven´t already). I've been checking out 101 Cookbooks since it was young, but I've never felt like making any of the recipes from the site. The only one I ever tried was the straw-and-hay fettuccine, as presented on Simply Recipes. I wasn't all that impressed-- still, your blog makes me want to run out and buy Heidi's book! Every single one of those recipes looks irresistible (and doable!). This is so random. I had the otsu recipe from the 101 blog in my files from a long time ago and Googled it tonight only to find your beautiful blog. Great photos! Can you say more about the photo/recipe with the kiwi? As for otsu, I still have not found the answer I was looking for, which is, is that a dish served hot, cold, room temp, or all of the above? I'm looking for something to take to a potluck. hi, thanks all for your comments and my apologies for such a super-slow posting... any question about the then unexplained photos should now be all clear, I hope. Kathy - thanks, I'm not a professional photographer in a sense that it's not my full-time job! Ishuku - thanks for pointing me to that, I never knew it... the 海鮮醤 we get here in Japan does contain seafood extracts, so I thought they'd be the same stuff... mmm. someone posted the comment at 3:23 AM, July 16, 2007 - every single recipe here really was doable and tasted great, trust me! Harvest - I've never even wondered, but I believe Otsu should be served chilled or at least at room-temperature... you might want to keep the cooked noodle and dressing separately, both chilled, and assemble it just before serving, as soba noodle should never absorb the dressing too much, if you ask me! Life always gets away from me, and my blogs suffer. Lately, when people ask: how are your blogs? I reply: barely alive:). I DO always mean well... this post of yours was chocked full of great pics and food; it must've taken some time! Nice to hear about people cooking their way through Heidi's book!